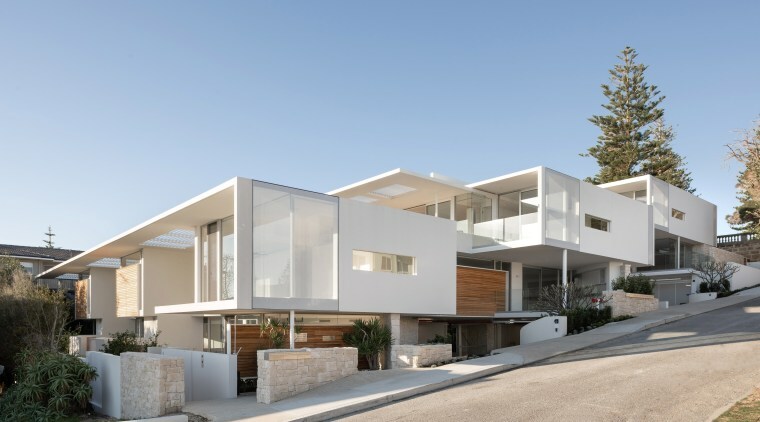 Seen from the street, these apartments are light-toned and linear. Square windows to the sides of the deck terraces feature a dotted privacy pattern, so occupants can look out while, depending on the sun’s angle, passers-by can’t look in. ‘Not in our backyard’ runs the cry when the word development is mentioned in the context of a traditional single house suburb. 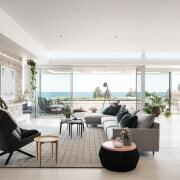 And all the more so when the area in question is a pretty, sought-after beachfront district in Cottesloe – the site of this respectful 11-apartment complex. Luckily, Overton Apartments by Banham Architects are a master class in creating a development that adds to, rather than detracts from, the quality of the neighbourhood. 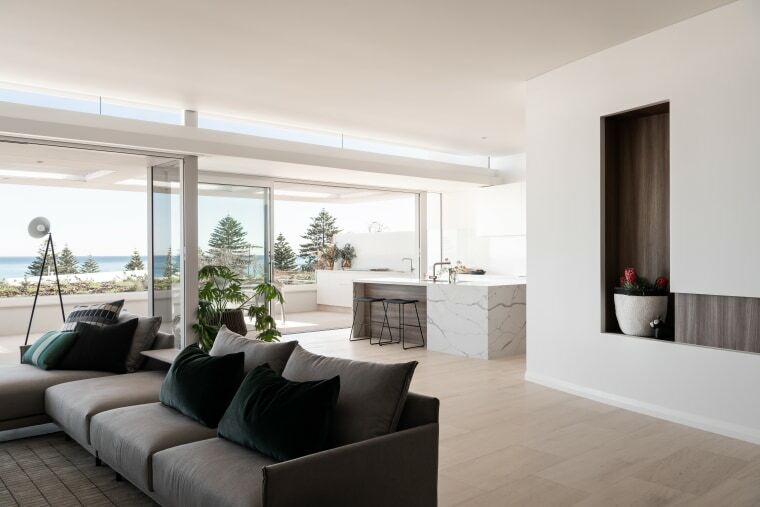 There were many things to consider when Rod Hamersley of Australian Development Capital was presented with the opportunity to create luxury apartments in the premier seaside suburb. “We were lucky to acquire three adjacent sites at once in this popular seaside area – then came the tricky part of achieving local council consent. 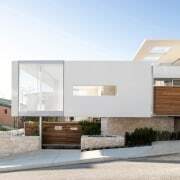 The list was long, every element another factor to be addressed in plan by architect Steeg Banham of Banham Architects. 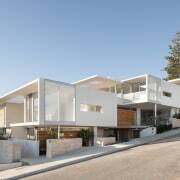 The units had to appear as separate homes from the street – each with their own entrance, not reach above 7m from the ground at any point on the sloping section, and car parking was to be kept out of the public eye – all factors adding up to a residential feel. 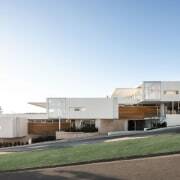 Lastly, the units had to present a low, dignified profile to the heritage Cottesloe Civic Centre and gardens sited above. Banham worked with all these constraints, turning them into positives for the refined apartments. Operable louvres in the penthouse pergolas – some cantilevered – keep the interiors at comfortable temperatures. 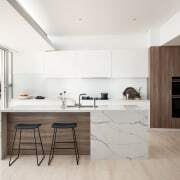 The development, by Banham Architects, creates upmarket units in a luxurious yet demure design that doesn’t stand out from the established stand-alone housing types in the neighbourhood. 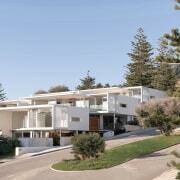 All about understated elegance, the apartments have a classic modernist-minimalist aesthetic. 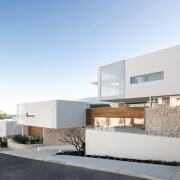 Smooth white rendered facades are matched with rugged stone walls and garden surrounds that reference limestone cliffs in the area. Teak elements add another natural accent. These will weather to a silvery driftwood hue over time, so more closely toning in with the other surfaces and the setting. 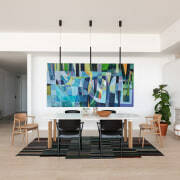 Banham’s architecture delivers generous living spaces with a strong connection to the environment for residents and guests despite maintaining the required low profile to the neighborhood. The penthouses have generous decks that look over roof gardens atop the units in front. 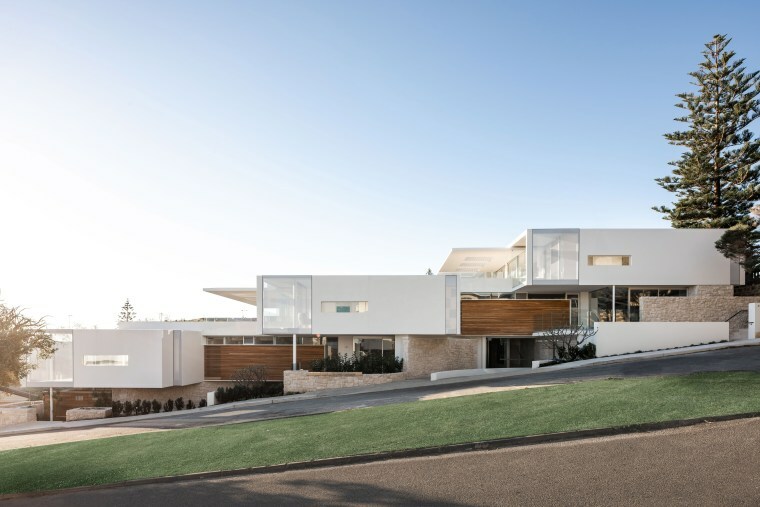 As these gardens mature, views of the oceans will be framed by the vegetation below and by the extended cantilevered pergolas above – the latter requiring complex engineering to achieve the luxury of a view with no obstructing poles or supports. The pergolas include imbedded operable louvres. 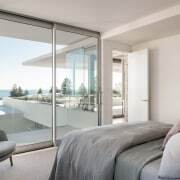 In these luxury seaside Overton Apartments in Cottesloe, WA, some rear bedrooms have niche views through into the living spaces and views beyond. The wall cut-out in this living space conceals one such viewing niche. As per the brief, and also in response to the need to configure so many spaces in a limited area, the layouts of the apartments are all quite different. Curved internal walls, necessary to resolve garage issues, were turned to good effect – offering slow reveals of the views in some penthouses. Entries to the underground garages are also curved, helping keep cars and parking out of sight from the street. 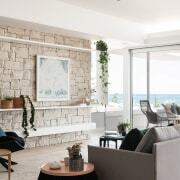 Furthering the apartments’ connection to their setting, the stone walls seen on the facade are re-introduced on some interiors. Limestone floors run from indoors out to the decks. These have the look of beach sand, complete with tiny imbedded fossils. And how best to present a demure face to the Cottesloe Civic Centre above? For privacy, the rear wall of the top penthouses have similar operable louvres to the pergolas, while many of these units have a see-through quality. When drapes are open, visitors to the centre and gardens enjoy sightlines right through the low-slung architecture to the sea.